MARSEILLE, France (AP) — Top-seeded Stefanos Tsitsipas clinched his first title of the year and second of his career after beating 50th-ranked Mikhail Kukushkin 7-5, 7-6 (5) in the Open 13 final on Sunday. The 20-year-old Greek had 14 aces and won 84 percent of his first-serve points against the 31-year-old Kazakh, whose only title was nine years ago on indoor hard courts at the St. Petersburg Open in Russia. His career is very much in the ascendancy. Earlier this year, Tsitsipas became the youngest Grand Slam semifinalist since 2007 when he reached the last four of the Australian Open, getting the better of 20-time Grand Slam champion Roger Federer along the way. 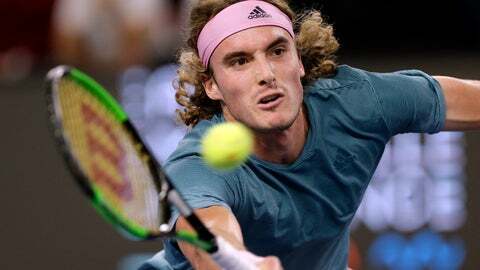 Tsitsipas did not drop a set in winning the Open 13 title in southern France and also beat Kukushkin for the second time, having won their previous meeting on outdoor hard courts in Dubai last year.